Eric and Lindsey Eggum met in high school, but they never really spoke much. Years later, the two reconnected at a mutual friend’s going-away party. One month into dating, Lindsey knew she wanted to get married. She waited patiently for what ended up being a magical proposal. 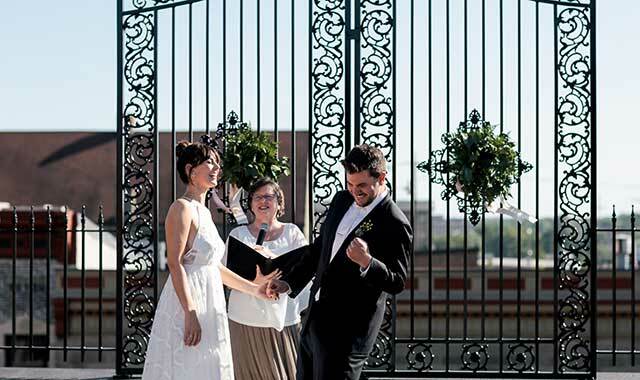 The couple knew they wanted to get married in Beloit after touring the rooms at Ironworks Hotel. With their accommodations set, all they needed was a venue. Less than 10 minutes away, Lindsey stumbled upon Beloit Club and was instantly hooked. Even the locker rooms were stunning. 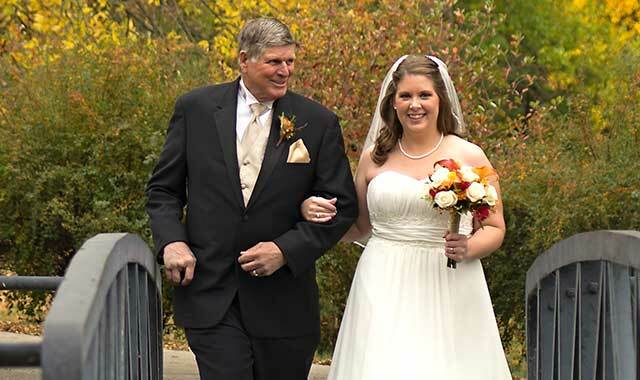 The couple booked Beloit Club a year in advance for their ceremony and reception. The on-site wedding coordinator, Megan, helped the day to run smoothly as planned. Beloit Club also handled the catering. Lindsey’s last piece of advice? Trust the process, and trust your vendors. DJ: Dominick from Luxe Productions, Loves Park, Ill.
Videographer: Weltzin Media, Pingree Grove, Ill.
Bakery: By the Dozen, Machesney Park, Ill.
Alanna Cieslek knew what she wanted, so she went after it. Instead of waiting for John Kveton of Berwyn, Ill., to ask her out, Alanna, of Palatine, Ill., took the bull by the horns and asked John on a date when they were both students at the University of Illinois-Springfield. After the couple dated for four years, Alanna knew she was ready to marry John. But it took John an additional three years to pop the question. He proposed when the couple visited Portland, Ore., in the summer of 2017. The pair had rented a house whose backyard garden had a beautiful archway. That first night in town, John asked Alanna if she wanted to get some snacks. She agreed, and John exited the room. Alanna went to the car, thinking he was there. The car was empty, so she went looking for him. When it came time to select a wedding venue, the couple knew Cliffbreakers, in Rockford, was the right place. Now that the facility’s multimillion-dollar face-lift is complete, director of catering Sarah Buscemi and the rest of the team are welcoming brides back to the classic venue. “It’s a new era of classic elegance,” she says. Equipped to host both a wedding ceremony and a reception, Cliffbreakers averages 25 to 30 weddings a year. Accordingly, Buscemi suggests couples book their weddings at least six months in advance. Not only can couples enjoy their wedding celebration here, but their guests can stay overnight at the adjacent Riverview Inn & Suites. The couple were married on June 23, 2018, making them the first couple to celebrate a wedding in the renovated venue. Alanna says she’s received rave reviews from her guests. “People came up to me several times near the end of our reception, telling me that this was one of the best weddings they’ve been to,” she says. 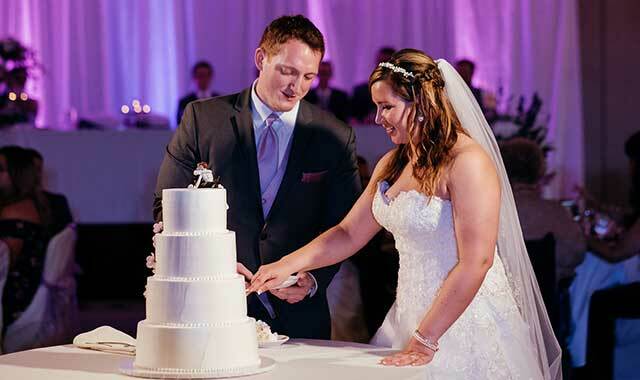 She credits the staff at Cliffbreakers for turning her wedding dreams into a reality. 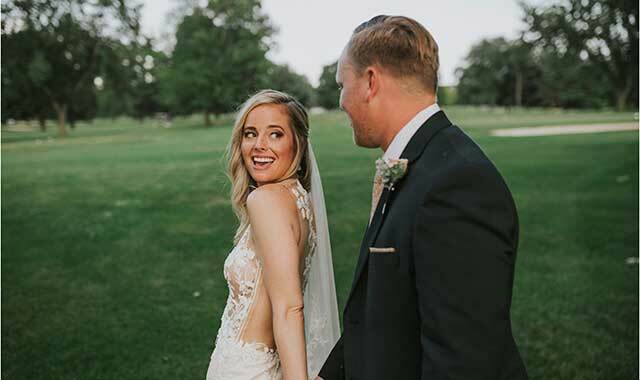 A Nice Ring To It: Woodbine Bend Golf Course, Stockton, Ill.
Ben Blair tried finding love online, but he wasn’t having any luck. So, he went to a friend and co-worker for some help. In September 2016, Ben knew it was time to propose. The couple had recently bought a house, and in the kitchen was a brand-new countertop. One day, Julia left to run a casual errand. Once she was out the door, Ben set his great-grandmother’s wedding ring on the counter – right on top of the blemish. When it came time to select a wedding venue, Ben knew he wanted to use Woodbine Bend Golf Course in Stockton. It offers several outdoor spaces, including decks and event areas on the course, making it an ideal venue for weddings and receptions year-round. To make sure they secured the location, the couple booked the venue about eight months in advance. The couple were married on Dec. 9, 2017, in front of 180 people, the capacity of the banquet hall. Ben says the staff at Woodbine was very flexible, so the couple could truly customize their experience. Since the wedding happened a little more than two weeks before Christmas, their decor took on a Christmas theme. The cake had red and green Christmas decorations, Julia wore a red dress and Ben wore a red vest. 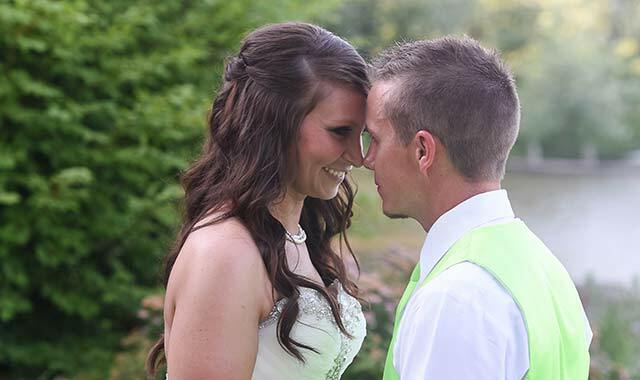 The maid of honor wore a green dress and the best man wore a green vest. 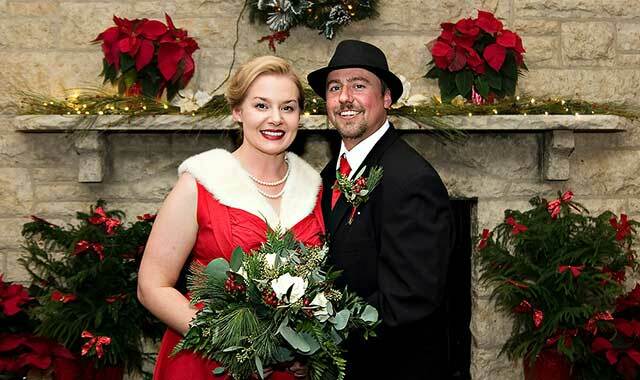 The ceremony was held in front of a fireplace surrounded by decorated Christmas trees. Looking back, Ben says his wedding at Woodbine couldn’t have gone better. Ceremony/ Reception: Woodbine Bend Golf Course, Stockton, Ill. Photographer: Tonia Blair Photography, Stockton, Ill.
As Lora Rice and Bryan Moscinski searched for their ideal wedding venue, the two longtime friends knew they wanted a smaller, more intimate celebration. They preferred something outdoors, but they also wanted the reassurance of an indoor backup. Then a friend turned them on to Burpee Museum of Natural History, in Rockford, a venue better known for its famous fossils than its social events spaces. It had everything they expected, plus a staff that remained flexible to the couple’s needs. And, the location’s natural, picturesque setting along the Rock River allowed the couple the space they desired, with the flexibility to make their event intimate and special. Burpee Museum has a scenic ceremony spot on the banks of the Rock River as well as indoor space for large receptions. Brides are invited to prepare next door at the historic Barnes Mansion, a riverside home that once hosted lively gatherings of Rockford’s elites. Lora loved the setting, and she especially loved the easy backup option: the Mahlburg Auditorium, a high-ceilinged social space with large windows, located just off the museum entrance. It didn’t hurt that the couple’s guests and children were invited to explore the museum throughout the day. On June 25, 2017, Bryan and Lora were married at Burpee Museum’s Riverfront Amphitheater, the Rock River providing a scenic backdrop to the day. With their closest family and friends attending, the couple enjoyed a simple champagne-and-cake reception, hosted outside on the terrace, which has space for cocktails, eating and dancing. The Barnes Mansion and its nearby turn-of-the-century boathouse provided picturesque scenery for wedding photos as the bride and groom prepared. Looking back on her wedding day, Lora is grateful for the Burpee team’s eagerness to make her day special. Grant Magnuson and Katie Harkness were students at Western Illinois University in 2010 when they started dating. Everything was going well until life got in the way. Grant, who grew up in Belvidere, graduated and began student teaching and living in Chicago. They continued dating while Katie, a North Aurora, Ill., native, was a senior at WIU, but eventually, they went their separate ways. When Katie graduated, she took on a teaching job in North Carolina. After about a year, Katie moved back to Illinois, where Grant was waiting. When it came time to propose in August 2017, Grant decided to pop the question on the deck of his future mother-in-law, Karen. “I wanted to do it there because I know Karen’s house is Katie’s favorite place to be,” Grant says. One of Katie’s friends took her shopping while Grant set up. Katie thought her mom had been out of town, but she was actually helping to get things ready. Later that night, Katie had planned to have dinner with Grant and some friends, but along the way, Grant said they should swing by her mother’s place to drop off their dog, Harry. The couple decided to get married at Prairie Street Brewing Co., in Rockford, because the moment they walked into the venue, Katie knew it was true to them. The couple were married on July 6, 2018. They locked down the wedding venue 11 months prior. Set along the banks of the Rock River, Prairie Street Brewhouse offers scenic views of downtown Rockford and an old, industrial feel. The century-old building creates a scenic backdrop for the special day. Katie gives credit to the staff at Prairie Street for making the celebration run smoothly. Katie looks back on her wedding day with happiness, knowing the day was a true celebration of her and Grant’s love. Music/DJ: Brent Wetter, DJ from Luxe Productions, Loves Park, Ill.
Bride’s Gown: Wolsfelt Bridal, Aurora, Ill. Hair & Makeup: C+M Bridal Beauty, Hinckley, Ill.
Love at First Click: Starved Rock Lodge, Utica, Ill.
Five years ago, Hayley and Manuel Villafuerte started talking through a dating website. Four months later, they finally met in October 2012. They hit it off – “he was a very kind and funny man,” says Hayley, and, after nearly six years of dating, she said, ‘I do’ on March 30, 2018. 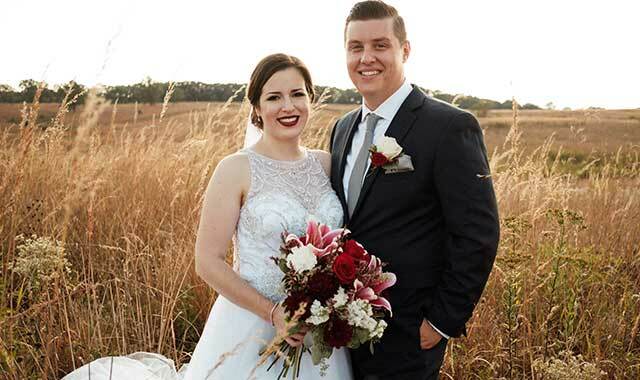 While the happy couple, who live in Grundy County, Ill., had many decisions to make, selecting a wedding and reception venue wasn’t difficult at all. They selected the only venue they visited: Starved Rock Lodge & Conference Center, in Utica, Ill.
Starved Rock offers two indoor ceremony venues for couples. The Great Hall can accommodate up to 200 guests and the ceremony takes place in front of the largest two-sided fireplace in Illinois. Because they were married in early spring, Hayley and Manuel got married in front of that fireplace. For more intimate ceremonies, the Canyonside Cabin can hold 30 guests. Both locations are backup locations in the event of rain. 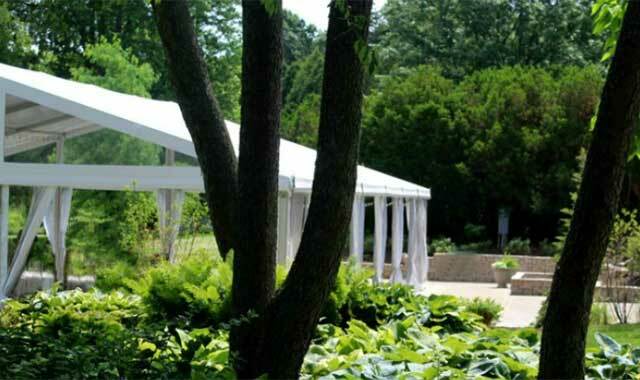 Starved Rock Lodge also has two outdoor venues. The Sunrise Shelter is located east of the lodge and has room for 200 guests. Couples exchange vows surrounded by towering pines, while overlooking the top of Starved Rock. The Canyonside Courtyard holds 30 guests while still displaying the beauty of the great outdoors. Ceremony/Reception: Starved Rock Lodge, Utica, Ill. Catering: Starved Rock Lodge, Utica, Ill.
Music/DJ/Photo: Matt Makeever, a local high school teacher, was the piano player for ceremony and cocktail hour. Location musician Steve Sharp played for the reception instead of a DJ. Flowers: Mary’s Special Touch Floral Studio, LaSalle, Ill.
Four years ago, Rockford native Bretta (Grumley) Hutchinson packed her belongings, leaving Chicago for a new life in Boston. That bold move led to the 2007 Boylan High graduate meeting the man of her dreams. John is a manager of commercial sales engineering for a Boston company. The pair first met at a local bar and hit it off. A week later, Bretta and John went on their first date: dinner at a Scottish restaurant/tavern called The Haven. When John finally popped the question, the couple decided to get married back in the Midwest. They looked in Chicago but found most venues to be too costly. Instead, they opted for Bretta’s hometown of Rockford, where they got married on the rooftop patio at The Standard, in downtown Rockford, on June 10, 2017. Bretta and John appreciated the aesthetics The Standard offered for both the wedding ceremony and the reception. After the nuptials were finished, the 130 guests headed to the second floor where a spacious dining hall is located. The food is prepared by Chef Paul Sletten, who owns several downtown restaurants. These days, the couple is home in Boston. They stay busy with their new dog, Squirt, a German Shepard/Corgi mix, and also explore new restaurants, hike and attend an occasional Red Sox or Bruins game. Master Planners: Maxson Riverboat and Riverside Restaurant, Oregon, Ill.
After a year of dating, the couple acknowledged they had a serious connection and hoped eventually to get married. Ken bought a ring, but the “right moment” to propose never seemed to arrive. The No. 1 priority when searching for a wedding venue was finding a location with a waterfront view. The couple was thrilled to find Maxson Riverboat and Riverside Restaurant, in Oregon, for their June 25, 2016, wedding. A longtime favorite for casual dining, banquets and dinner cruises on the Rock River, Maxson had the beautiful views the couple hoped for. And, it was close to Polo, where Ken grew up and where the couple lived. Ceremony: Northwest Territory Historic Center, Dixon, Ill.
Catering/Reception: Maxson Riverboat and Riverside Restaurant, Oregon, Ill.
Music/DJ: Illusion Audio, Polo, Ill. Photographer: Erica Pospeshil Photography, Dixon, Ill. Flowers: Country Floral, Polo , Ill.
Cake: Aurelio’s Bake Shop, Sterling, Ill. Decorator: Something Barrowed, Something Blue, Rochelle, Ill. Couples who get married at the Rockford Woman’s Club, in Rockford, could be following in the same footsteps as their parents and even their grandparents. The Rockford Woman’s Club building turns a century old this year, and the historical, majestic venue in downtown Rockford has held weddings since the very beginning. “I’ve had granddaughters get married here, and their grandparents and their parents have also held their wedding receptions here,” says Nancy Whitlock, president of the Rockford Woman’s Club. More than a gathering place, The Rockford Woman’s Club is an organization of women who seek to promote and encourage philanthropy, civic and cultural improvement and education in the Rockford area. Preserving their building is an ongoing priority. You’ll find the woman’s club at work supporting and offering opportunities for women of all ages to grow and serve within the community, Whitlock says. The club, which has served our region for more than 120 years, owns the venue at 323 Park Ave., located along the Cultural Corridor, in Rockford. The facility is available to the public for a wide variety of special events, including weddings, bridal and baby showers, private parties, seminars and business meetings. Tucked inside the building is The Rockford Theater, an 800-seat auditorium. For larger gatherings, the theater lobby can be expanded. 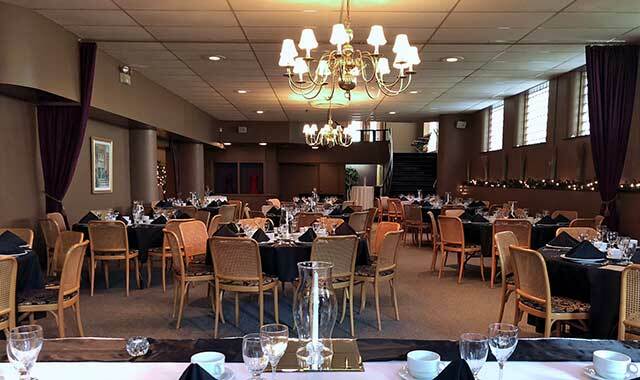 When it comes to weddings, the Rockford Woman’s Club is convenient because it can accommodate many needs in numerous spaces. Dates fill up quickly, so Whitlock recommends booking a wedding reception at least a year in advance. Whitlock says that, while there have been plenty of upgrades through the years, the character and charm of this building are still intact, making it a perfect place to host a wedding and reception. The upper level of Rockford Woman’s Club has a large space for music and dancing inside the Belle Keith Art Gallery. The sunroom off the gallery offers a backdrop for photos or a quiet place to relax. 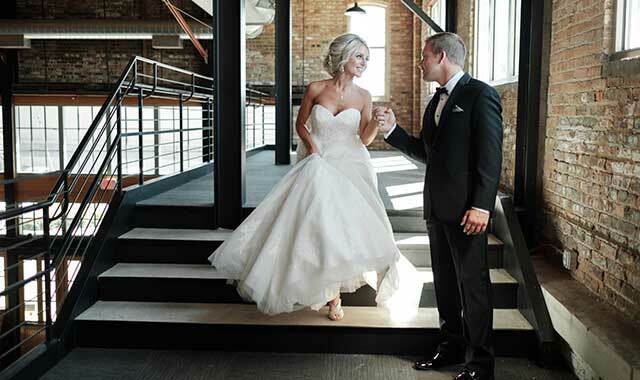 A circular balcony just outside the gallery doors could also serve as the perfect place for a bouquet or garter toss. Guests use a grand staircase as they head downstairs to the elegant banquet facility. A beautiful, ornate, wooden bar area is located right off the main dining room. Decorating the wedding venue is one thing brides don’t have to worry about, because the building is beautiful just the way it is, Whitlock says. Many years ago, Derek Peach asked Andrea Hannaford to their high school’s homecoming dance. The couple lost touch during college, but occasionally they’d see each other around their hometown of St. Charles. After graduating, Andrea decided to reach out. After many years of dating, Andrea was itching to get married. She was thrilled when Derek proposed during a hike at Starved Rock State Park, in Utica, Ill.
Andrea visited numerous wedding venues, but it was Klehm Arboretum & Botanic Garden, in Rockford, that won her over. 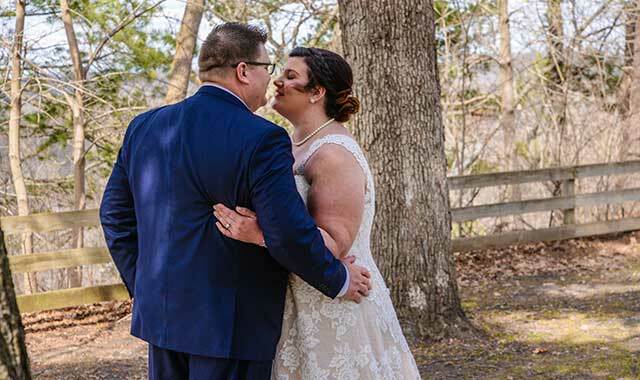 She knew she wanted an outdoor wedding in a beautiful setting, and Klehm’s 155-acre campus of majestic trees and gardens fit her vision perfectly. Not only that, but the wedding coordinator, Mary Pat Muzzarelli, was a delight to work with. Klehm’s recent renovations can accommodate 25 to 400 guests for ceremonies and receptions. A classic, white tent with an adjoining terrace sits just steps away from beautiful scenery. Picture Perfect: Byron Forest Preserve, Byron, Ill.
After 2.5 years of dating, Seth McCammond was ready to propose Marta. The couple had met while working at a pet store. On March 12, 2016, Seth organized a family game night at his parents’ house. His siblings and grandparents were there, in addition to Marta’s family. During a game of Pictionary, it was Seth’s turn to draw and Marta’s turn to guess. The guess was correct, and both families cheered. “I looked back to Seth and he was down on one knee, with a box in his hand and a gorgeous sapphire ring inside it,” Marta says. They both teared up as she accepted his proposal. The couple were married on Sept. 23, 2017, at Byron Forest Preserve, Byron, Ill. Their ceremony was held under two trees that formed a natural arch on the front lawn of Byron Forest Preserve, and their reception was held at the Jarrett Prairie Center in the newly renovated museum and on the 2,600-square-foot wrap-around deck that overlooks 400 acres of prairie. To make things even better, the sun was setting during their first dance as a married couple. The Baltic Mill’s unique, natural setting welcomes couples who want an outdoor celebration for their wedding day. The historic area, owned by the Belvidere Park District, provides a backdrop of calming greenery for ceremonies. The venue currently focuses on holding ceremonies in an outdoor setting – perfect for any couple looking for a beautiful setting on a budget. The Baltic Mill offers four wedding packages for brides and grooms to choose from. Each package includes a three-hour time block for ceremonies to commence in an area with a stage and hillside seating for guests. Larger packages include a conference room and rehearsal time for the night before. An on-site wedding coordinator is available for all packages. Reservations are taken on a first-come, first-paid basis, with various times available on weekends and throughout the week. The Belvidere Park District requests that couples book the Baltic Mill at least 90 days prior to the event. However, the Belvidere Park District is willing to accommodate couples with any last-minute requests if dates are available. The venue has anywhere from 20-40 weddings per year – a significant amount considering that the season is only from April to October. The space can hold 300 guests, all on natural limestone seating. Those interested in seeing the facility can call and schedule a tour. This entry was posted on Friday, August 17th, 2018 at 12:00 pm	and is filed under Northwest Woman, Top Posts. You can follow any responses to this entry through the RSS 2.0 feed. Both comments and pings are currently closed.